Circular outline. Circular, plain, concave discus has central filling hole and narrow, rounded framing ring. Plain, sloping shoulder to sharp rim. Flattened ring handle with high central ridge applied to back rim and upper back wall, where the attachment is pressed out flat. Fabric: 2.5YR 7/8, light red. Slip. 5YR 7/4, pink. Somewhat hard, fine fabric with platy fracture has uncommon, small, subangular, white (calcitic?) and black inclusions and common, very small flecks of golden mica. Thin to somewhat thick (around shoulders), even, matte slip is slightly more pale than fabric. 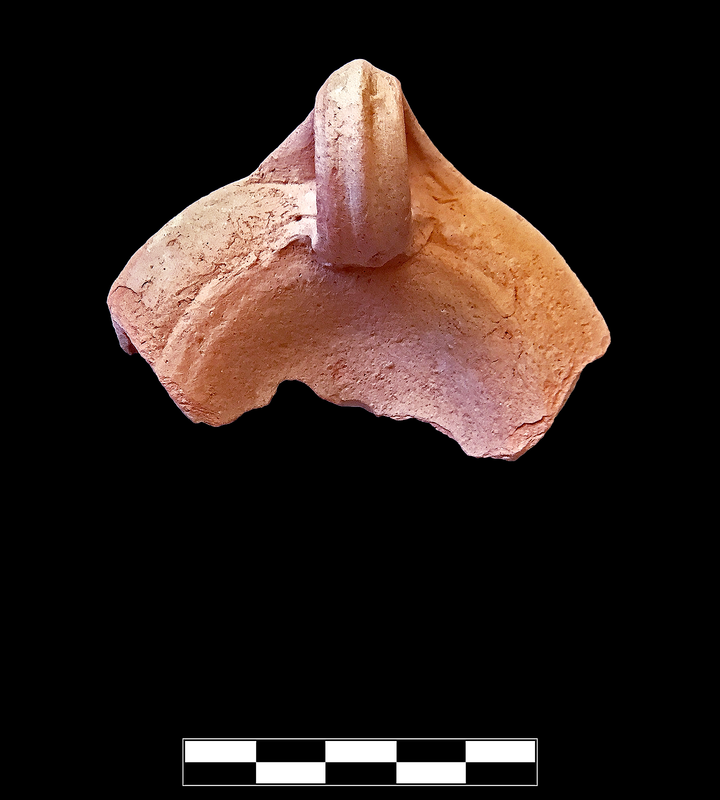 One large fragment preserves one third of discus and shoulder, entire handle, and back wall. Moderate, extensive abrasion.